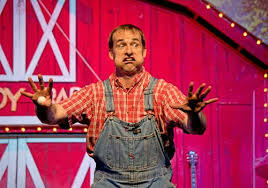 Smoky Mountains Lodging Guide: THE FUNNIEST SHOW IN PIGEON FORGE - THE COMEDY BARN! 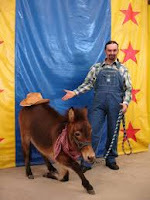 THE FUNNIEST SHOW IN PIGEON FORGE - THE COMEDY BARN! The Comedy Barn Theater is celebrating 23 years of clean, family comedy in Pigeon Forge, and today, the laughs are bigger than ever. This is a show that you can bring the entire family to - from toddlers to grandparents - and everyone will enjoy the entertainment. Why? Because not only will the comedians make you laugh until your sides ache, but you will be amazed by jugglers, ventriloquists, magicians, cloggers and some of the best music in the Smokies. One of the new acts this year is a world champion juggler from Holland. This Dutchman will amaze you with his juggling skills and special effects. Amazing is also the word for Danny who 'juggles' ping-pong balls in a most unusual way, Eric, who plays the human xylophone, Stephen the ventriloquist, and the Talking Dog! Yes, talking dog. But wait, there are other animals in the show who perform stunts and tricks almost to perfection. You will be amazed and entertained. This is the most attended clean comedy show in the WORLD!! Then there is the Amazing Animals Exotic Animal & Pet Show where you can see pigs, parrots, cats, dogs and donkeys onstage doing their best to make you go "ohh" and "ahhh" and laugh a lot. This animal troupe has performed on television, in Branson, at pet expos and even with the Royal Hanneford Circus! So plan to attend a Comedy Barn show next time you are in the Smokies. There's lots to do and you can get information at http://bestreadguidesmokymountains.com/ about dining, shopping, attractions, outdoor activities and other live show like the Hatfield & McCoy Dinner Show. Also download the BRG App for more deals and information.